A little Cuban flair gives this sandwich big flavor. Place chicken breasts in a resealable large storage bag. Pour the marinade over chicken. Marinate in the refrigerator for 2-6 hours. In a small bowl, combine the mayonnaise, marmalade, lime juice and zest, jalapeno, salt and pepper. Keep in the refrigerator until ready to serve sandwiches. 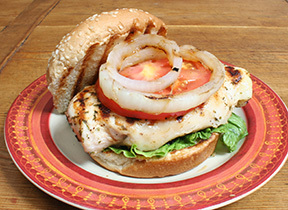 Heat grill to medium, grill chicken until no longer pink in the center - approximately 10-15 minutes. Sprinkle split rolls with olive oil. 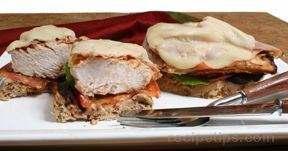 Place slice of muenster cheese on top of the chicken until melted. 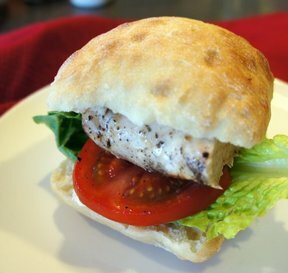 Assemble sandwiches with chicken and buns. Serve with mayonnaise dipping sauce. 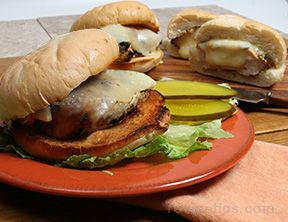 Note: If the chicken breasts are large you may want to slice them in half to create two sandwiches.